Tag Archive | "2018 AFC West Preview"
The Chargers will look to ride the hot streak they had at the end of last season and put it all together this year for 16 games. The Chargers have the makings to be a very dangerous offensive team. Philip Rivers is still a very good quarterback who, frankly, would be considered a no doubt Hall of Famer if he had a ring. They have added Mike Pouncey at center and with Russell Okung at tackle, the line is solid. Much like his draft class mate Todd Gurley, Melvin Gordon has appeared to figure it out at running back and expect another plus 1,000 yard season from him. 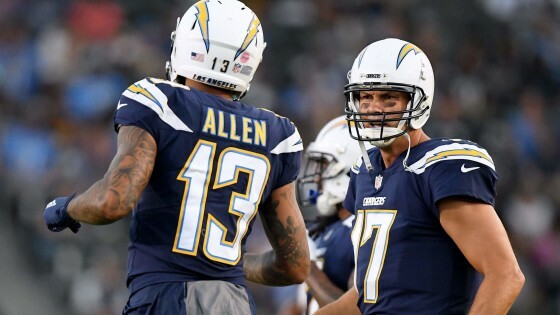 Keenan Allen should be in All-Pro discussion come year’s end. On the defense, Joey Bosa has really started to become that dominant pass rusher you would expect from a player picked as high as he was. With Melvin Ingram on the outside, they will often have quarterbacks uncomfortable this season. Casey Hayward has found a home at cornerback with the Chargers, and Jahleel Addae has become a productive safety. Chargers could be a dark horse Super Bowl contender with that offense if it gets hot at the right time. I know many are high on Patrick Mahomes, and he has impressed in preseason, but I see some drop off this season from the veteran Alex Smith to Mahomes. They do have weapons for the young quarterback in Travis Keller at tight end and Tyreek Hill and newly added Sammy Watkins at receiver. Kareem Hunt is also dangerous at running back, so the offense will be solid. I really don’t care what type of guy Marcus Peters was in the locker room, he was simply too young and too talented to let walk out the door. Anyone trying to justify that move is wrong, and it will definitely hamper this defense. Kendall Fuller is solid, but he is not Marcus Peters in replacement. Anthony Hitchens is a nice addition at linebacker, but he has to stay healthy. As good of a coach as Andy Reid is, he has to start delivering playoff victories in Kansas City. Far too many disappointments under his tenure there. I have to say I have big problems with the way Jon Gruden has conducted himself since becoming the head coach in Oakland again. I never like the ‘my way or the high way’ approach many coaches have. If a player acted as if he was more important than the team, he would be vilified. So, why do we accept it from a coach? Let’s see if there is a method to his madness and after 10 years away he can get the offense cooking. Amari Cooper is a playmaker on the outside. Let’s see if often injured Jordy Nelson can provide balance opposite Cooper. Marshawn Lynch doesn’t appear to have anything left, and he should have been the one pushed out the door, not Kahlil Mack. Speaking of which, his departure is significantly going to hamper this defense. Mack was a game changing, Defensive Player of the Year candidate. Regardless of the haul they got in return, you don’t let a guy like that walk. It will be up to Bruce Irvin to pick up the slack rushing the passer. Karl Joseph (safety) and Gareon Conley (cornerback) are two very good young players who should anchor that secondary. Maybe, Gruden has a master plan. Until I see it though, I’m keeping them 7-9. It will be interesting to see what Case Keenum brings to the Broncos offense this season after last years debacle at quarterback. While Keenum did have a strong season last year in Minnesota, it is important to remember that, other than last year, he has been a below average quarterback his entire career. Keenum has had difficulty throwing for over 60% completion his entire career until just about 68% last year. He does have weapons in Demaryius Thomas and Emmanuel Sanders on the outside, and Ronald Leary anchors a decent offensive line. The defense is still pretty solid with Von Miller rushing the passer, and the more Shane Ray develops opposite of him the more dangerous their pass rush will be. The loss of Aqib Talib will hurt, however, and I don’t see the defense being strong enough to carry a poor offensive team.